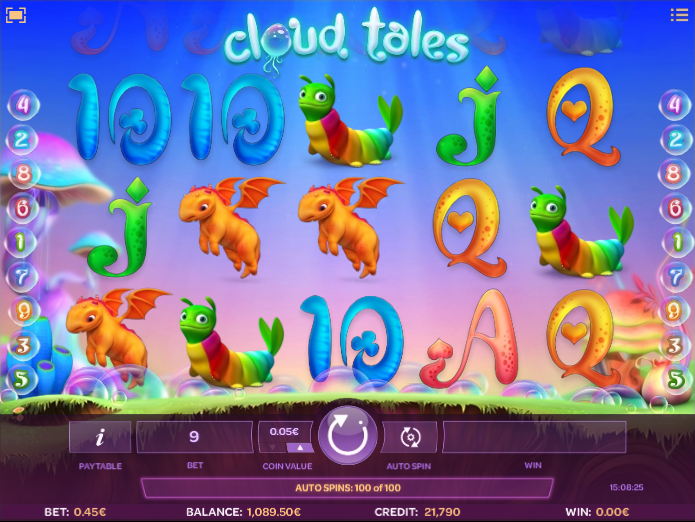 Cloud tales is a five reel slot with three rows and just nine fixed paylines; this fantastical world is filled with multicolour plants and rainbow bubbles visible behind the transparent reels. The high value symbols are four odd creatures best differentiated by colour – blue, pink, orange and multicoloured; 10, J, Q, K and A make up the lower values. 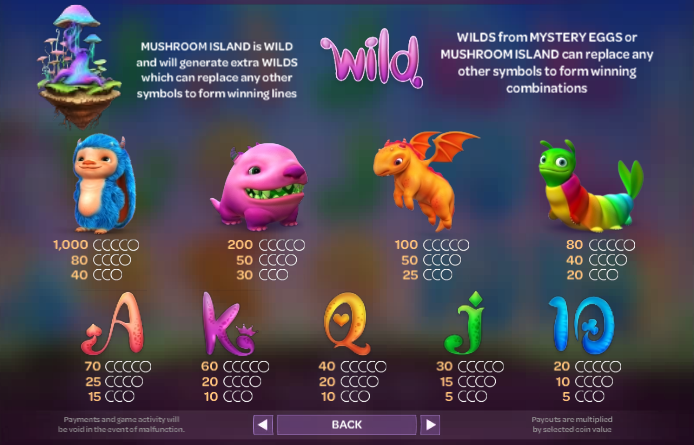 The wild symbol is the Mushroom Island which appears only on reel three – it will substitute for all others to help form winning combos and it also has a bonus feature attached which is explained below. As well as acting as a normal wild, when the Mushroom Island lands it will distribute a random number of extra wwilds on to the reels which will then be reevaluated for any payouts. Symbol Switch – symbols on the reels will swap position to (hopefully) provide a win which will be multiplier by 4x. Wilds + Multiplier – the egg becomes wild and makes other symbols wild also; any wins will be subject to a random multiplier value. Wild Reels – up to five reels will become completely wild. Wild Reels + Respin – the reel containing the egg will become completely wild and remain in place for one respin; more eggs landing will repeat the process. Cloud Tales is a refreshingly unusual slot with some top notch (but slightly freaky) graphics and some clever bonus features; it’s worthy of a solid recommendation and comes with an RTP of exactly 96.00%.